Detached bungalow in a cul-de-sac village location. The wow factor is apparent as you enter the living room and gaze at the uninterrupted open rear aspect beyond the conservatory and rear garden. With an entrance hall, lounge/diner, kitchen, bathroom, conservatory, three bedrooms with master having an en suite shower room, an early viewing is a must! The property is within walking distance of the railway station and bus stop and close to local amenities such as the doctors surgery, Co-op, Post Office and chemist. ENTRANCE HALLWAY Wood flooring, coving to the ceiling, access to the loft, radiator, cloaks cupboard, doors to the lounge/diner, bedrooms and bathroom. LOUNGE/DINER 11′ 9″ x 22′ 1″ (3.59m x 6.74m) Double glazed patio door to the conservatory at the rear, radiators, coving to the ceiling and gas fire suite. CONSERVATORY 9′ 1″ x 9′ 7″ (2.77m x 2.93m to the maximum) Brick and uPVC double glazed construction with French doors onto the garden and glass roof. 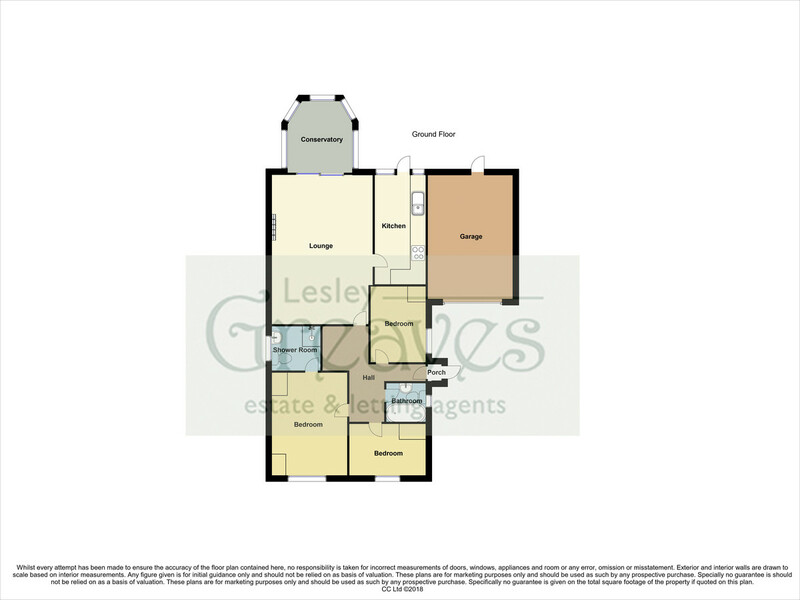 KITCHEN 8′ 1″ x 11′ 0″ (2.48m x 3.36m) Fitted kitchen comprising wall and base units with a work surface incorporating a sink unit with a stainless-steel mixer tap. Spaces for a fridge/freezer and washing machine. Fitted oven, gas hob and stainless-steel extractor hood. Tiled splash backs, radiator, uPVC double glazed windows and door to the garden at the rear. BATHROOM Bathroom suite comprising a low flush WC, pedestal wash hand basin and panelled bath. Tiled splash backs, extractor, laminate flooring and a uPVC double glazed opaque window to the side. EN-SUITE Fitted suite comprising a low flush WC and wash hand basin within a vanity unit and shower cubicle with a mains fed shower. Tiled walls, tiled floor, radiator, extractor and uPVC double glazed opaque window to the side. BEDROOM TWO 9′ 9″ x 9′ 5″ (2.99m x 2.89m into recess and to the back of the wardrobe) uPVC double glazed window to the front, radiator, laminate flooring, access to the loft, fitted wardrobe and dressing table. BEDROOM THREE 9′ 2″ x 8′ 2″ (2.81m x 2.49m) uPVC double glazed window to the side and a radiator. OUTSIDE Gravelled driveway to the side providing off street parking and access to the garage. There is further parking at the front, ideal for a caravan. 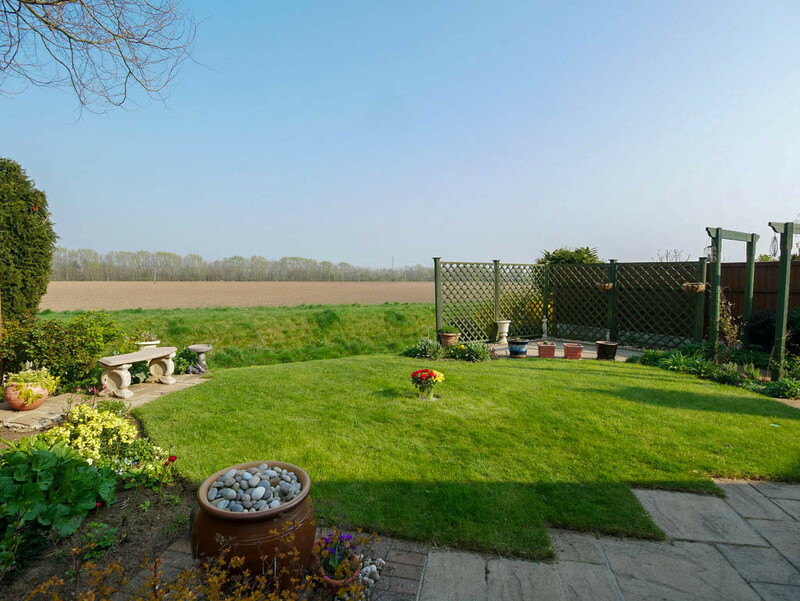 To the rear is a paved patio area leading on to a lawn garden with open countryside views. There is also a pergola, security lighting, outside tap and gated access at the side.